Swift Springs enable you to tune your suspension to your unique settings. Swift Springs is proven technology on the track giving you a faster, smoother, consistent ride, so you outperform your competitors in any race. Diameters and spring rates may be similar, however, the spring manufacturing process is crucial in determining how well they will perform. To achieve the top 5, Swift Springs developed a proprietary steel alloy "HS5.TW", as well as a proprietary winding method that no other coil manufacturer can duplicate. 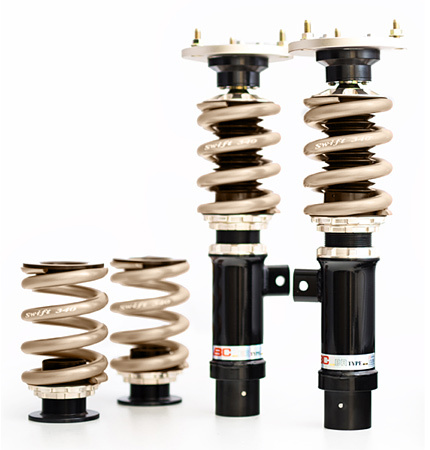 Fitting world class Swift Springs helps racers get a podium finish. 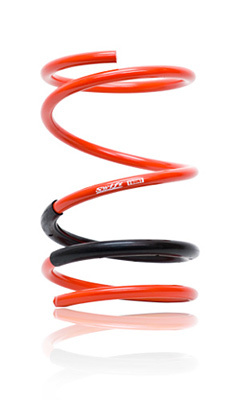 The revolutionary Swift Springs coils were first manufactured in 1997. Since then Swift Springs have been fitted by the best world class race teams in different races formats including off pavement and dirt oval track, road, road racing, rally, autocross, motorcycles, drift, and more. Swift Springs uses a very strong alloy which means they use a thinner diameter of wire. This thinner wire is lighter and since this is unsprung weight, it is important. Very important. Thinner wire means there is more gap between the coils, so there is more 'stroke' for the spring. This means it has more travel and does not 'bottom' as early as a thicker wire spring. Swift Springs are incredibly consistent. At the end of a year of racing, they are typically within .5-1.0% of the rate they were when they came out of the box. Founded in Tokyo, Japan in 1997, Swift Springs was originally a motor sports division of Tokyo Hatsujo Manufacturing Co, Ltd, leaders in the spring industry since 1924. Swift Springs came about as part of a project to demonstrate their superior engineering by developing the next generation of suspension coil springs for motor sports. The project scope was to beat the best of any brand or design in the market, making the springs the lightest and most durable, while still being affordable. Since its inception Swift has been lead by the former racer and suspension expert, Kei Yokota, and chief engineer, Yasu Saito. Their first-hand involvement in the racing industry has propelled Swift through the ranks of the world's most prestigious races. Swift Springs rapidly became the most recognized and respected name in performance coil springs in motor sports worldwide. Swift's impressive motor racing history began in 1998 with Nissan Skyline GT-R in the Super Taikyu Endurance championship series in Japan. Swift went on to support championship teams in Nurburgring 24hrs, Super GT (JGTC), Le Mans 24hrs, Super Taikyu series, D-1 World Grand Prix, F3, F3000, Formula Toyota, and other world class races. Team Goh Audi R8 won 1st place in 2004 with Swift Springs at the Le Mans 24hrs race. © COPYRIGHT BC PERFORMANCE PARTS USA INC. ALL RIGHTS RESERVED. The content on this page was created by PC Performance Parts USA Inc., an authorized dealer of BC Racing. This content or any portion thereof may not be reproduced or used in any manner whatsoever without the express written permission of BC Performance Parts USA Inc.